This is the first of a series of IOCS meetings which are scheduled to take place every two years. 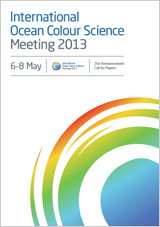 The primary focus of the IOCS meeting is to build and strengthen the international ocean colour community by providing a structure and mechanisms to collectively address common issues and goals. The aim is to achieve the best quality ocean colour data that meet scientific, environmental, climate and operational needs through international collaboration and scientific and technological innovation.